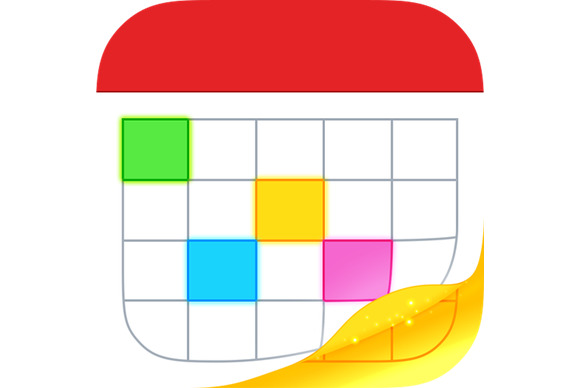 Last fall, I reviewed Flexibits’ Fantastical 2 for iPhone, a nice upgrade to my favorite calendar app for iOS. But as good as Fantastical 2 was, it was still missing one thing: an iPad version. That didn’t stop me from using Fantastical on my iPad. Despite a glut of iPad-friendly calendar apps in the App Store, I liked Fantastical’s intuitive interface and stellar natural-language event-creation capabilities so much that I ran the iPhone version on my iPad in 2x mode. I don't have to do that anymore: Flexibits has finally released Fantastical 2 for iPad. And though it’s not quite the revelation the original version was for the iPhone, it gives you everything that’s great about the iPhone version along with an interface that takes advantage of the iPad’s larger screen. Fantastical 2 for iPad requires iOS 7 and costs $15, though Flexibits is currently offering it for an introductory price of $10. As obvious as “Fantastical on the iPad” sounds, Flexibits faced some significant design challenges when it came to upsizing the app. 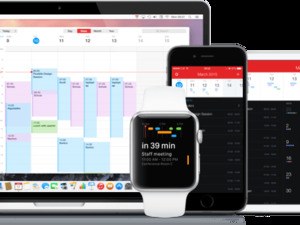 Foremost among them is the fact that Fantastical, on both the iPhone and on the Mac, uses a tall, narrow interface: the signature DayTicker (by default, a five-day summary view, which can be expanded to a month view) at the top, and below that a vertically scrolling, chronological list of the events in your calendars. (Yes, if you rotate your iPhone to landscape orientation, you get a full-screen, week-view calendar. But that’s more of a bonus—most of the iPhone app’s features and functions are focused on the vertically oriented interface.) In fact, the taller the screen, the better—Fantastical for iPhone is a superior experience on an iPhone 5 or 5s than on an older iPhone with a shorter screen. The iPad’s screen, by comparison, has a much wider aspect ratio, even in portrait orientation. But Flexibits couldn’t just make the event list and DayTicker wider, as you’d end up with lots of blank, unused space. So the company came up with what it calls the Dashboard. Instead of the two panes of the iPhone version—the DayTicker on top and the event list on the bottom—the Dashboard offers three sections: a larger DayTicker on top, the scrolling event list on the left side below it, and a monthly calendar on the bottom right. But the iPad’s DayTicker is also much more useful than the iPhone’s. Whereas you can swipe down on the iPhone’s DayTicker to get a simplified monthly calendar, with colored blocks representing events, on the iPad the first swipe gives you a detailed week view, complete with event times and specifics. And if you swipe down on the DayTicker a second time, you get a full-screen calendar. The Dashboard’s monthly calendar is essentially a simplified version of this full-screen calendar. Instead of detailed event information, it shows you, using colored dots, which dates include events for your various calendars. It’s not as useful as the full-screen calendar, or even the expanded DayTicker, when it comes to viewing the details of events, but it’s handy to be able to see a monthly calendar while looking at specific dates and events in the other sections of the screen, and it’s convenient to see, for example, which days are full of work appointments and which have only personal events. Unlike the iPhone version’s screen-specific views, Fantastical for iPad’s Dashboard gives you all the same views and options in both landscape and portrait orientation, with the only real difference between orientations being how much space each section gets. For example, with the DayTicker collapsed to show just the upcoming days, portrait orientation gives you a tall, narrow monthly calendar and an event list that shows roughly 15 events; landscape orientation displays a wider monthly calendar (and DayTicker) with a list of roughly 10 events on the left. Whichever the orientation, the three sections of the Dashboard—the DayTicker, the event list on the left, and the month view on the right—always stay in sync. Scroll one, and the other two scroll to keep up; tap a date in a week or month view, and the other two sections jump to display that date. It’s elegantly done. Tap an event to see its details, including a map preview if a location is included. Tapping any event, in any calendar or list, shows its details. If an event includes a location (and that location is detailed enough for Fantastical to pin it down), viewing the event’s details screen displays an inline map; you can tap the arrow button under the map preview to open the location in the Maps or Google Maps app (whichever you’ve chosen in Fantastical’s settings). You can also choose whether URLs open in Safari, Google Chrome, or 1Password. Reminders are also handled a bit differently on the iPad version, thanks to the tablet’s larger screen. Instead of a Reminders submenu in the event list, the iPad version of the app displays a dedicated button (which looks like a checkmark) in the title bar; tap that button (or swipe from the left edge of the screen) to view a slide-in Reminders list. Visual differences aside, Fantastical for iPad works much like Fantastical for iPhone, which is a good thing. The red title bar indicates the current month and year and offers buttons for accessing settings and creating a new event, though on the iPad you also get a dedicated search button. (When you launch Fantastical for the first time, you’re asked to allow it to access your calendars and reminders—a standard procedure in iOS 7. Any calendar you’ve configured in iOS 7’s Settings app should work with Fantastical.) Tap the date in the title bar to jump to the current date; tap and hold to access the date picker to jump to a particular date. You create a new event by tap-holding anywhere in the DayTicker or monthly calendar, or by tapping the plus-sign (+) button in the title bar. That's when Fantastical’s flagship feature comes into play: Just type a description of the event—or even an abbreviated version of it—in everyday language. (Fantastical 2 understands English, French, German, Italian, and Spanish.) For example, typing Lunch with Jon Monday at Amici’s results in an appointment called Lunch with Jon, scheduled for Monday at noon, with Amici’s as the location. Typing Staff meeting on phone every Monday 1030a gives you a repeating event entitled Staff meeting that occurs every Monday at 10:30am with phone as the location. You can even use complex date descriptions such as last Monday of every month and first weekend of the month. Adding /[calendar name] to the description adds the new event to that calendar, rather than to the default one. Type your event description in everyday language; Fantastical figures out the details. Fantastical interprets your text on the fly and shows you a preview of the resulting event in the DayTicker. Though other calendar apps (including iOS’s own Calendar) provide varying degrees of natural-language parsing, Fantastical’s is the best I’ve used. You can also use iOS’s dictation feature to input your event description, and Fantastical integrates, using URL actions, with automation apps such as LaunchCenter Pro and Drafts, so you can send event descriptions to Fantastical from them. While creating a new event, tapping Details displays a traditional set of event-entry fields that you can use if the preview isn’t quite right; if you need to add a URL, a note, or some other info to the event; if you want to tweak a recurring schedule; if you want to invite other people to your event; or if you’d like to add a location. Whichever approach you use, tap Add, and the event is added to your calendar and appears in the DayTicker and event list. You can move an event by dragging it in the DayTicker or detailed calendars, and deleting an event is as simple as left-swiping over it in the event list and tapping the Delete button that appears. You can also use natural language to create reminders, which you do by tapping New Reminder in the Reminders list; by tapping the event/task toggle when creating a new event; or by simply starting an event description with “Reminder,” “Task,” “Todo,” or “Remind me to.” Typing (or saying) Remind me to call Jane Thursday at 4pm creates a reminder, for 4pm on Thursday, to call Jane. A nice detail here is that when Fantastical determines you’re creating a reminder instead of a calendar event, the calendar is blurred and a large task-entry box appears, making it clear what you’re creating. As with events, you can specify a particular list using /[list name], and the Show Details button reveals options such as date/time reminders, geofencing, priorities, and text fields for URLs and notes. 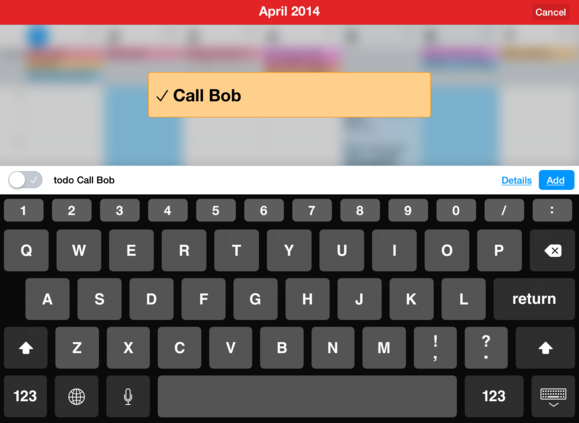 Fantastical for iPad makes it obvious when you’re creating a new task instead of an event. Other features new in version 2 of Fantastical for iPhone are also present in the iPad version: Background App Refresh support lets the app automatically check for new and updated events and reminders; Fantastical provides its own notifications; and you can quickly duplicate, move, or share (as an .ics file) an event by tap-holding it in the events list. 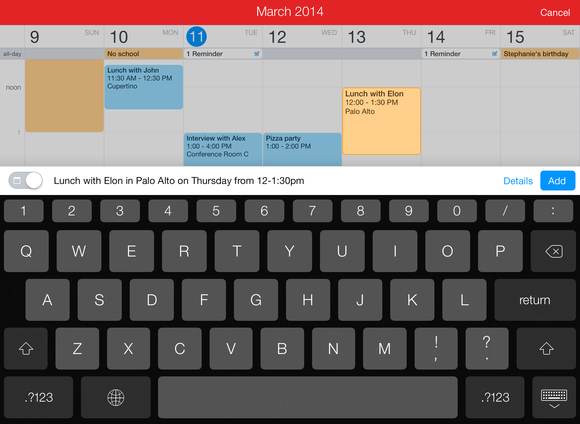 Fantastical’s extended keyboard includes a dedicated row with numbers and the / and : symbols for easier date and time entry, and you can choose between dark and light themes. Fantastical also supports TextExpander Touch for quicker data entry. Finally, both Fantastical for iPad and the iPhone version have gained some new features since I reviewed the latter. The first is floating time-zone support, which always shows dates and times in the selected time zone, rather than your current time zone if you’re away from home. There are new options for the app’s home-screen badge: you can now have the badge indicate the current day’s remaining items, today’s remaining events, today’s due reminders, all incomplete reminders, all overdue reminders, the current date, or the current calendar week. And Fantastical now offers custom alert sounds for events and reminders. When I first started using Fantastical for iPad (first beta versions and then, over the past couple weeks, the final release), I found the layout to be a bit odd, especially the simplified monthly calendar on the right. But I think that was mostly because I was used to the iPhone version’s vertical-layout emphasis. Once I got accustomed to Fantastical for iPad’s different appearance, the app really grew on me. It has my favorite features of the iPhone version—the DayTicker, the scrolling event list, and the great natural-language event creation—along with a much-improved week view that’s especially good when it fills the screen. In fact, I find myself using Fantastical for iPad differently than I use the iPhone version. As I noted in my review of the latter, Fantastical for iPhone is primarily an app for quickly viewing your current and upcoming events and tasks, and for making it as easy as possible to create and edit those items. But thanks to the iPad’s larger screen and Fantastical for iPad’s full-screen calendar, I use the iPad version like a traditional calendar app—browsing the detailed week view—much more often than I do on the iPhone. Which is a testament to the fact that Fantastical for iPad isn’t just a scaled-up version of an iPhone app. Is it for you? Unlike the iPhone, where I think Fantastical is easily the best calendar app around, the iPad has a glut of solid calendar offerings. But if you’re a fan of Fantastical on the iPhone or the Mac, as I am, you’ll love the iPad version, despite (or because of) the interface tweaks required to fill the tablet’s screen—it’s the same app, with the same great set of features. If you’re currently using a different calendar app, with a more-traditional calendar look, Fantastical for iPad’s interface may take some getting used to. But I think that interface, along with Fantastical’s unique features, will win over many a user. 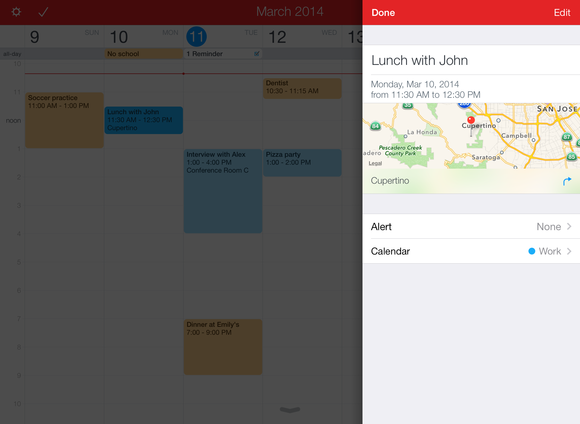 Fantastical 2 gets the iPad treatment, but it's more than just a scaled-up version of the iPhone app.